208 pages | 13 B/W Illus. Air safety is right now at a point where the chances of being killed in an aviation accident are far lower than the chances to winning a jackpot in any of the major lotteries. However, keeping or improving that performance level requires a critical analysis of some events that, despite scarce, point to structural failures in the learning process. The effect of these failures could increase soon if there is not a clear and right development path. This book tries to identify what is wrong, why there are things to fix, and some human factors principles to keep in aircraft design and operations. Chapter I: Commercial Aviation: A General Picture. Chapter II: Event Analysis as an Improvement Tool. Chapter III: The changing role of Technology and People in Aviation. Chapter IV: People as alternative resource: Feasibility and requirements. Chapter V: Organizational Learning in Air Safety: The role of the different stakeholders. Chapter VI: The engine for Organizational Learning: Where it is and where it should be. Chapter VII: The Future of Improvements in Air Safety. Chapter VIII: Conclusions. Jose Sanchez-Alarcos earned a PhD in sociology and a BS in psychology. 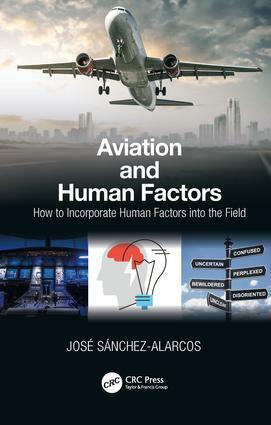 His doctoral dissertation was about organizational dynamics under air safety, and since then he has been actively involved with human factors in aviation. Dr. Sánchez-Alarcos is a member of EAAP and a CREE certified practitioner. He has worked as an HF consultant and trainer for EASA, Airbus, Mitsubishi Aircraft, the Colombian army, INAER, CAA Spain and Mexico, and many others. He also has served as an HF expert in accident investigation and, outside of the aviation field, in NPPs, nuclear waste installations, and maritime and railroad transportation.